We all know the holidays are a time for bringing people together. And that includes friends, family, co-workers and even those in need. So GameTruck Savannah would like to offer some party ideas to make it happen. We know there’s a lot on your plate already during the holidays so why not let GameTruck Savannah entertain your crew for a few hours with the totally unique experience of a video gaming party everyone will love. 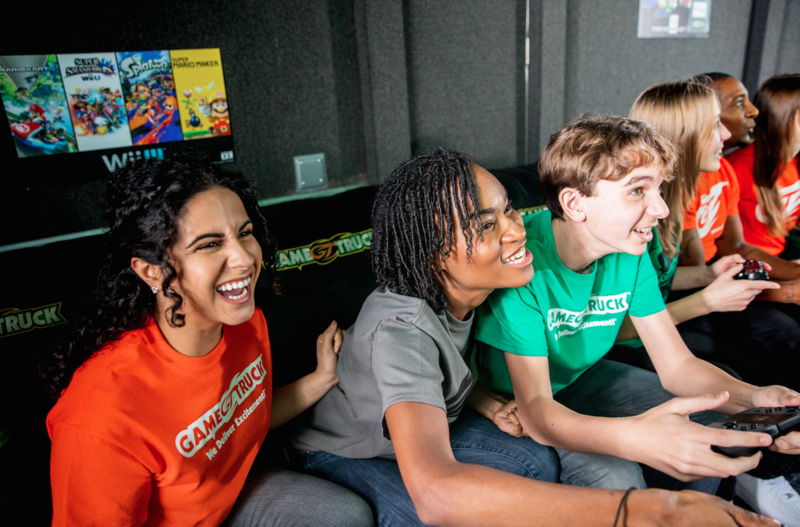 Locally owned and operated, GameTruck Savannah’s team brings the ultimate mobile gaming experience right to your front door. Owner Brandon Walters personally oversees every detail, so you don’t have to. Our set-up includes a state-of-the-art mobile gaming trailer where your holiday party guests will enjoy a climate controlled game theater with comfortable seating, plenty of high-def flat screen TVs, the latest video game consoles and loads of new and classic games. Keep in mind that GameTruck isn’t just for kids. We’ve got a huge range of video games for grown-ups too. We’ve got a great selection of classic and modern video games, like Call of Duty, Sonic, Super Mario, Halo, and Just Dance, to name a few. Plus, you’ll have a certified gaming coach to MC and keep everyone engaged and entertained. Entertaining during the holidays should be fun! So get outside the box and mix in a GameTruck Party and make this a season you will actually enjoy just as much as your guests will. Give us a call at (866) 253-3191 or shoot us an email at savannah.095@gametruck.com for pricing and reservations. What are some of the oldest gaming consoles you have at home? Maybe you’ve got a GameCube or Nintendo 64 lying around. Unless you’re a serious collector, you likely aren’t regularly playing Atari games. Even though there’s much-deserved hype about newer consoles like the Nintendo Switch, our team at GameTruck Savannah has an appreciation for the old days. Let’s take a look at some of the first gaming consoles to see how far we’ve come. In 1972, the first ever gaming console was released. It didn’t do well commercially – only about 350,000 units sold – but the consoles go for $400 today, so hobbyists appreciate the system. The Odyssey couldn’t play sound and came with physical dice. When compared to today’s units, it’s pretty much unrecognizable. A few months after the Odyssey was released, Atari brought some competition with Pong. Pong was first released as an arcade-style ping-pong game (as the name suggests) and later evolved into a console that was sold through Sears. This console became wildly popular because of its affordable price point. It sold for $50 (which would be about $221 today) and sold over a million units. The console allowed gamers to play tennis, hockey, handball and jai-alai. Developed by Mattel Electronics in 1977 and released in 1979, the Intellivision was advertised as an “intelligent television” and was intended as a competitor for the Atari 2600. It debuted with four games available but was loved by gaming fans – more than three million units were sold during its heyday. The Nintendo Entertainment System (commonly abbreviated as NES) changed the video game market. Originally released in 1985, this console is still a favorite among collectors and hobbyists. The NES is also notable because Nintendo allowed third-party developers to make games for the console. Once games didn’t have to be developed in-house, the number of choices increased dramatically. If you’re a gaming lover, consider reaching out to our team at GameTruck Savannah. We offer premier video gaming parties for video game aficionados of all ages. You’ll have the time of your life in our state-of-the-art mobile theater, and we’ll bring the party to your home, office, school or anywhere else. Click here for a free quote, or give us a call at 866-253-3191. Looking to host an exciting, fast paced outdoor adventure game for you and your friends? GameTruck Savannah offers high-quality tactical laser tag that will make your event unforgettable. Our mobile LaserTag parties are the perfect way to celebrate a special occasion and have a blast with your friends. We offer next-generation, incredibly accurate laser tag equipment that makes for exciting battles. GameTruck Powered LaserTag brings video games outside and into the real world! GameTruck Savannah delivers the excitement directly to your doorstep. The days when laser tag was confined to a dark room are over. Our advanced technology allows us to bring LaserTag out into the world by transforming your yard or park into an epic laser tag arena. Hosting a laser tag party with GameTruck is convenient and hassle-free. You just let us know the location of the event and we will show up prepared to convert it into a thrilling battle arena. Our staff works hard to make hosting a party with GameTruck easy by planning every last detail and communicating with you to confirm details and answer any questions you may have. GameTruck Savannah offers state-of-the-art laser tag equipment to make your party especially fun. Our incredibly accurate taggers mean you can tag an opponent up to 300 feet away! We offer the latest laser tag technology with precision optics, lightweight sensors, and audio and optical feedback. GameTruck Powered LaserTag can be played either indoors or outdoors, day or night. Our technology supports a wide variety of game types, keeping your experience fresh and thrilling. Our LaserTag provides engaging team-based missions that encourage connection and a bit of friendly competition. GameTruck Savannah’s mobile LaserTag parties can accommodate groups of all sizes and are the perfect idea for birthday parties, family reunions, school carnivals, graduation parties, and team-building activities. Our LaserTag parties are great for both kids and adults and offer the fun of paintball without the pain. Our engaging GameCoaches manage the entire event for you from setup to cleanup. They are experts at converting any area into a modern LaserTag arena, adding a variety of obstacles for strategic cover. Our GameCoaches also referee the games, making sure everyone has a safe and fun time. As the host, your only responsibility is to relax and enjoy the epic LaserTag battles. GameTruck Powered LaserTag brings you the fast-paced excitement of paintball without the mess or pain, and all from the comfort of your backyard! We specialize in throwing no-hassle parties for people of all ages. Let GameTruck Savannah make your next event extra special with our LaserTag and video game parties. 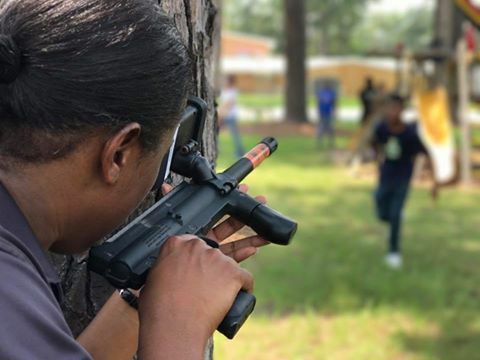 To learn more about our mobile laser tag parties, contact GameTruck Savannah today at (912) 877-6555.